Why two Nevada Republicans are saying no to Trumpcare. Is there any chance Republican Sen. Dean Heller will change his mind on Trumpcare? 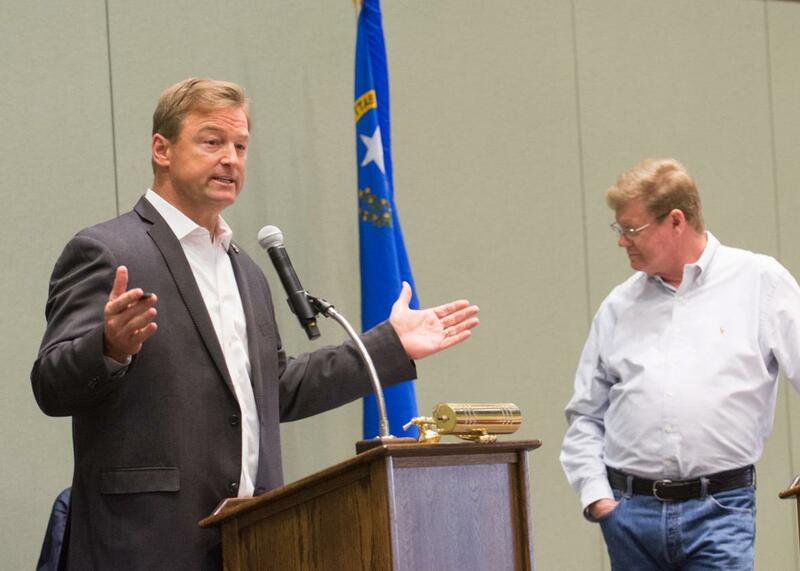 Sen. Dean Heller addresses a town hall with Rep. Mark Amodei at the Reno-Sparks Convention Center on April 17 in Reno, Nevada. If the Republican health care bill is going to be defeated, it will almost definitely require a “no” vote from Nevada’s Dean Heller, the state’s Republican senator. Last week, Heller and Nevada’s GOP governor, Brian Sandoval, held a press conference blasting the bill and decrying its changes to Medicaid. (The Congressional Budget Office estimated on Monday that the bill would leave 22 million more people uninsured by 2026.) Heller is up for re-election next year; Sandoval, meanwhile, is the most popular politician in the state. What exactly is going on in Nevada politics? To discuss this question and others, I spoke by phone with Jon Ralston, long considered the dean of Nevada political journalism and the editor of the Nevada Independent. During the course of our conversation, which has been edited and condensed for clarity, we discussed Harry Reid’s departure from the political scene, why big Nevada donors like Sheldon Adelson have so much riding on Obamacare repeal, and why Heller may prove hard for Mitch McConnell to win over. Isaac Chotiner: What did you make of the Heller-Sandoval press conference, and why is the Republican opposition to an Obamacare repeal, at least right now, so strong in Nevada? Jon Ralston: I was not surprised that Heller, who kept saying that he wanted to get to “yes,” would eventually land on “no.” He tethered himself to the most popular elected official in Nevada, who was the first Republican governor to expand Medicaid, and has hyped that ever since as putting hundreds of thousands of Nevadans on the rolls who otherwise would not be. Heller, not surprisingly, kept saying in the run-up to that news conference that he wanted to consult with the governor and see what the governor thinks. Heller is so vulnerable—he is the only Republican incumbent running in a state won by Hillary Clinton—and his numbers are terrible, and the health care bill’s numbers are terrible. I think the political calculus was pretty obvious. Is Sandoval generally a moderate governor, or has he just gone out on a limb on Medicaid? I have known Brian Sandoval for probably a quarter of a century. He has generally been a moderate guy, even way back when he was in the Assembly. But it’s hard to put an ideology on him. He likes to think of himself as a conservative. For instance, he is a big supporter of school choice and vetoed a record number of Democratic Legislature bills. But he is really a kind of post-ideology guy, in the sense that he was a federal judge and wants to be a federal judge again, and thinks like a judge. He is very, very deliberate. He is a pragmatist. He is known more for his affability and likability than anything else. How much opposition will there be within the Republican Party to these guys if Sandoval keeps up his opposition and Heller votes “no”? Sandoval clearly has not thought about being on a ballot again. That became obvious in the previous legislative session in 2015 when as a Republican governor he proposed the largest tax increase in state history. I don’t think he wants to be on the ballot; he isn’t like a lot of governors who want to go to the U.S. Senate. He wants to be appointed to the 9th Circuit Court of Appeals. His name was briefly floated as a Supreme Court nominee. I think that’s his ultimate goal. He’s a young guy in his early 50s. I don’t think he wants to be in elected office. He’s been called every name in the book by the right. He’s the RINO of RINOs. Then he isn’t getting a Supreme Court nomination. Exactly. And people have mentioned that: You can’t do what he has done and get appointed. Heller of course is a different story. Heller doesn’t even want to be in the Senate. He wanted to run for governor to replace Sandoval but essentially got pushed out of the race by Adam Laxalt, the up-and-coming attorney general who has owned the conservative side of the Republican base. Several polls show that Heller’s numbers here are worse than Trump’s and that’s really saying something. And that’s because he has tried to have it both ways: He has tried to please the base and tried to please independents, and you just can’t do that and hope to have good numbers. He has also made a lot of conflicting statements on health care and other topics. So there will be a primary challenge, you think? It’s interesting. I am sure that some of his prime benefactors, such as Steve Wynn and Sheldon Adelson are very upset with his opposition to this bill, because there are tax breaks in the bill that are huge. One calculation put Adelson’s at $40 million. Yeah. So will there be a [Senate] primary challenge? Danny Tarkanian, who has run for five other offices five other times here, but has actually won some primaries, is interested in running against Heller in that primary. I think he will have a primary. And if he survives, how strong a candidate is he? Heller is very, very vulnerable, but you used the verb survive, and if there is anything to be said about Dean Heller, it’s that he is a survivor. He should have lost in 2012 when he ran for the first time after being appointed by Sandoval, and he won by 12,000 votes in a year that Obama won the state by six points. So he finds a way to win. But next year is very problematic for him. If he survives the primary, the Democrats have anointed a woman named Jacky Rosen, who is a congresswoman who has been in office for six months and had never held public office before that. But she was a very effective candidate. It is a measure of the dearth of Democratic candidates and how the Democratic bench got wiped out in 2014 that Jacky Rosen is now being talked about as the greatest thing since sliced bread. We read years ago all these articles about Nevada moving ever-left because of the Hispanic vote. How would you describe Nevada politically in 2017? I think it’s accurate to say that we are a purple state and maybe even a little more tinged blue than red these days. But one of the oldest saws in politics is that you can’t beat something with nothing. And so you have to have candidates to win these races. The Democrats haven’t had a governor since 1998 in this state. Moderate Republicans have won most of those races. That’s why people think that if Heller can somehow posture himself and go down the middle, he can survive. I don’t count him out, but he has a really, really tough race ahead of him. And I assume you still see it as a purple state in presidential years. Yeah, I think it’s purple, leaning a little blue. The Democrats have about a six-point statewide registration advantage now. Clark County, which has three-fourths of the population, is very, very Democratic. The wild card is that Harry Reid is gone now. And Harry Reid created a Democratic machine in this state that is second-to-none. Now, Harry Reid is still lurking in the shadows and calling people. Some of his operatives are still active. But that’s not going to last forever, and we will see if they can replace that. Harry Reid to some extent is irreplaceable. Nobody meddled in the intricacies of Democratic politics the way he did. But if they can get a facsimile of that machine going, it is still going to lean blue in presidential years. Is there any way you see Heller getting to “yes” on Trumpcare? I would be shocked if he got to “yes.” He boxed himself in so badly, Isaac, in all the things he said at the press conference. It wasn’t just about Medicaid; it was kicking millions of people off of health care and invoking the poor and the disabled and the elderly as Sandoval looked on. He mimicked Sandoval’s position on a lot of different things, but even went further and said that people who argued it would decrease premiums are lying to you. How do you change from that? They can’t make that bill palatable enough for him to legitimately change. Well, Kellyanne Conway said that if you get kicked off Medicaid you should get a job, so there is always that message for the citizens of Nevada. I doubt we will see Heller saying that in ads.